Freyssenet M., Mair A., Shimizu K., Volpato G. (eds), One Best Way? Trajectories and Industrial Models of the World's Automobile Producers, New York, Oxford, Oxford University Press, 1998, 476 p.
The three supposedly successive production systems, craft, mass production and lean production, are actually the result of historic amalgams and conceptual ambiguities. The socalled craft system includes craft based companies, but also genuine industrial companies, even if they continued to produce vehicles at fixed work stations. These companies did not disappear from the United States in the inter-war years because of a lack of competitiveness, but due to a lack of liquidity, as revealed in Chapter 2 by Dan Raff. 'Mass production', otherwise known as the 'Taylor-Ford' system, encompasses different models, even if they do share certain principles in common. The Fordist model that can be seen today is different from Henry Ford's initial conception, and should not be confused either historically or conceptually with the Taylorist model or with the Sloanist model, for instance. The Fordist model has not been as universal as is often made out. Not only has it failed in countries where the conditions it required did not exist, but neither has it been automatically adopted in countries, like Japan, where mass production was certainly possible (Fujimoto and Tolliday 1998). The so-called lean production model is a combination of characteristics borrowed from various Japanese companies (Mair 1994). Finally, Toyota has been questioning the core components of its system at the very moment that it was being projected as the paradigm for the 21st century, as Koichi Shimizu reveals in Chapter 3. The belief in a ‘one best way’ for each major economic era leads the researcher, and even the practitioner, to interpret and analyze companies in terms of how faithful they are to the model considered to be the best, and to interpret their performance, whether superior, equal or inferior to what it is supposed to be, as a function of secondary, temporary or contextual factors which have intervened to modify the presumed cause and effect relationship. This approach frequently obscures the essential, that is, the existence of different profit strategies which require appropriate and coherent means if they are to be implemented effectively. Lastly, several company leaders, having internalized the reassuring image of the history of the automobile industry presented above, and newly converted to the excellence of 'lean production', forget to properly verify whether their own market, work organization and institutional contexts correspond to the conditions in which the apparently superior model is in fact valid and viable. It is scarcely surprising that they then experience failures, which are too quickly and conveniently explained away in terms of incomprehension of the system, errors of implementation, and resistance to change on the part of certain groups of employees. 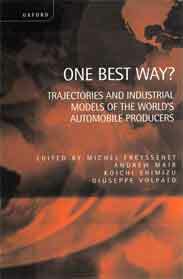 For these reasons, the authors of the chapters in this book, together with the entire group of researchers who have participated in GERPISA's international programme 'The Emergence of New Industrial Models', have accepted a requirement to start from empirical research, in this case focused on the trajectories of the automobile producers since the 1970s, prior to drawing conclusions about convergence or plurality of models. Two pitfalls had to be avoided: fastidious description, which too often leads to the conclusion that every case is unique, and superficial comparison that is satisfied to classify companies according to perceived similarities and differences. In contrast, the analytical framework adopted here is based on studying the changes that companies have made to the particular profit strategies and the socio-production systems that characterized them in the 1960s, in the context of the shared or unique problems that they have encountered since the 1970s and which help interpret what their evolution actually means. The authors of this book have then examined the attempts of the companies to make their changes coherent and, where this has been achieved, to characterise the models that have thus been constituted. The trajectories of fifteen companies have been studied. These encompass the major foreign subsidiaries, such as Opel Vaux hall Saab, for GM and Ford of Europe for Ford, as well as the brands absorbed or taken over since the 1970s, such as Seat and Skoda for Volkswagen, Lancia and Alfa-Romeo for Fiat, Citroën and Chrysler-Europe for PSA, Mazda for Ford, etc. Not all the independent companies that deserved to be studied in the book could be included, notably Mercedes and BMW, due to an absence of academic experts. The companies have been grouped by the three regional poles of the global automobile industry, East Asia, North America, and Europe, given the relative similarity of markets and work contexts facing companies within each pole. This permits the differences of trajectory and models in relatively similar contexts to emerge clearly. However, this principle is not adhered to in two cases: Hyundai, which is grouped with the Japanese companies, and Lada, where production conditions at the time of the Soviet Union were quite unrelated to those in Western Europe. Other parts of the world are not entirely ignored. The subsidiaries of the major producers present there are mentioned within their trajectories, although they are not analyzed directly. Another book resulting from the GERPISA programme studies them from the perspective of the transfer and hybridization of industrial models (Boyer, Charron, Jürgens and Tolliday 1998). Although to begin with the authors of this book had divergent views, as did many participants in the GERPISA programme (as can be read in the Preface), by the end of the process they agreed that convergence towards a single successful industrial model is no more likely today than in the past. Part 1. Only One Model In Japan? Part 3. Europa's Dilemna; Transfer, Adapt or Innovate? Automobile, car makers, productive models, employment relationships, productive organisation, product policy, business history, theory of firm, profit strategy, globalisation, regionalisation, growth model, labour, market, industriel relations, work organisation, wage system, work crisis. Économics, Management, Geography, History, History of Sciences and Technologies, Political Science, Sociology.